Considering that some of our most vocal local global warming doubters (AKA “those who reject mainstream climate science”) religiously subscribe to The Union, this might be a good match. Good luck with your book sales, sir! “While Estonia’s experience and those of other Scandinavian countries sing a siren song to our progressives, what they always overlook are the stark differences between a large, inhomogeneous, and culturally diverse America, and the small, culturally homogeneous countries that dot the globe. The only way we can even attempt to replicate the idylls of small country harmonies is to create a hierarchy of ever smaller and distributed jurisdictions in our land that can enjoy the benefits that derive from common cultures. Our Town. Eat your heart out Thorton Wilder. They’re starving because of climate change. A lot of talk about a 91 year old vanity press author seeking to sell a few books by advertising on local newspapers. What is news is that he advertised here because he knew somehow that there is a cluster of idiots who pretend to know something about science but whose ideology has blinded them. My guess is he found The Next Grand Minimum or read the alumni newsletter for Harvey Mudd College. 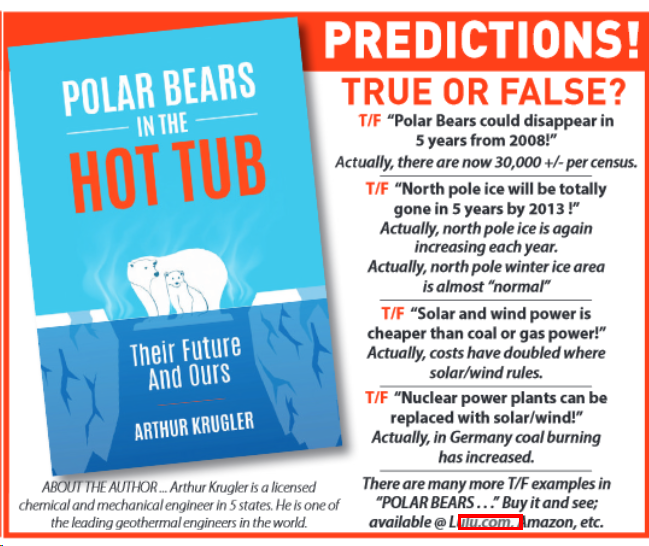 I’m reminded of this ad that ran in The Union: https://sierrafoothillsreport.com/2015/11/08/local-global-warming-hoax-ad-in-the-union-will-inform-many/ This is not your typical community newspaper content in Anytown U.S.A. Looking at charts of arctic sea ice extent and thickness it is at historic lows. It IS rapidly disappearing just like Greenland’s glaciers. Two days ago a researcher tweeted a photo showing open water off the coast of Barrow Alaska, very odd considering this is the coldest month of the winter up there, she noted at 11:20 PM it was 30 F, -30 F is more typical. The arctic is changing fast, real fast. Interesting that the local climate deniers are just like this author. They have no knowledge, background, or education in climatology. The author of this book is a geothermal engineer. The Union has another contributor that has a quack cancer cure. I think only Breitbart and the Enquirer who have as many “experts”. Now that obviously self published book is next to the editorial page on A5. Next Next post: Another Boardman error; this time he blames spell-check!